Week 15. List some vital signs. Talk about specific birth, marriage and death certificates. Topics may include misspelled names, fudged dates, other anomalies that stand out in your records. What was my second great grandmother, Rose Newmark's maiden name? I've blogged about this conundrum before, but I thought I would share with you some of the confusing documentation. Her husband, Samuel, was the informant for both of the daughters. Rose was the informant for Israel. One might assume she pronounced her name more clearly than her husband, though that is uncertain. Both were illiterate in English, as both signed their names with an X. 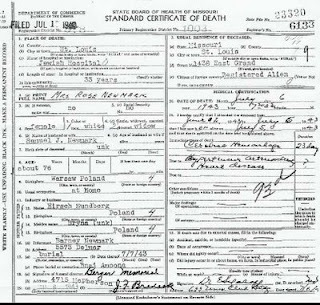 On her death certificate her maiden name was listed as 'Sundberg', and the informant was her son, Barney (my great grandfather). Her father's name is listed as Hirsch. A search of the JewishGen databases (now also available at Ancestry) reveals three individuals named Cantkert (pronounced Tsantkert) in the 1907 Duma Voter Lists in the town of Warka, one of them named Hersz. It is conceivable her father was still alive in 1907. 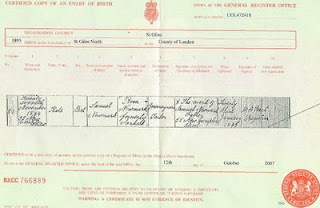 If born 30 years before Rose, he would still have only been 72 in 1907. Unfortunately, all the voter lists indicate is that he was over 25. However, since this family was residing in the same town I know Rose and her husband Samuel came from, and the surname would have been pronounced close to what ended up on her children's birth certificates, it is my best lead. These three phonetic approximations and the family's origin in Poland provide some interesting clues. Researching the family in Poland may involve trying a lot of different spellings. The -on-, -an-, -and- part may stand for the nasal which is represented by an "a" with a hook underneath in Polish. And it looks like the second syllable could be -gard, -gart, -kard, -kart, -kert, -gert (I'm guessing there was an "r" but the person transcribing the name didn't always hear it).